LONGVIEW, Texas -- Peaking at the right point in the season, St. Thomas reached the summit with a 67-55 victory over second-seeded LSU Shreveport in the championship game of the 2019 Raising Cane's RRAC Men's Basketball Tournament. 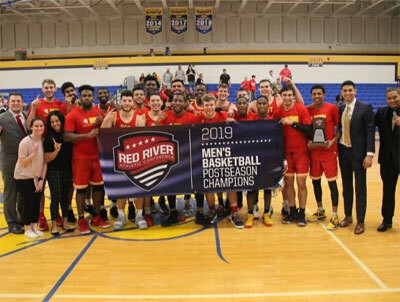 The Celts won on three consecutive nights at Solheim Arena at LeTourneau University to earn their second tournament title and an automatic berth to the NAIA Division I Men's Basketball National Championship. Junior Kennard Robinson (5'9''-PG) scooped up the Tournament MVP award with a stellar performance. He scored 26 points on 8-of-11 shooting from the field and 4-of-5 from three-point range. The UST point guard was everywhere with five assists, five rebounds and two steals. Robinson was the Celts' top scorer in the semifinals as well with 22 points and seven assists. After falling behind by nine points to LSUS at 36-27 early in the second half, UST went on an 11-0 run sparked by a free throw and a three-pointer from Robinson. The Pilots would take the lead one final time at 39-38 before another Robinson three-pointer put the Celts back on top. They held the lead until the 3:37 mark when Tim Coleman of LSUS scored five consecutive points including a three-pointer to tie the game one last time at 52-52. UST's Cameron Gims (6'4''-G) made both of his free throws on the next possession then Robinson drilled another three-pointer after an LSUS turnover to rebuild the lead. The Celts outscored LSUS, 10-3, down the stretch to receive the conference trophy. Gims finished the game with 12 points, and Nathan Thormaehlen (6'6''-F) contributed 10 as both were named the the All-Tournament Team. Coleman and Josh Stamps (6'5''-G) notched 14 points each for LSUS, while Jeff Garrett (6'7''-F-94), the RRAC Player of the Year, was held to nine points and 13 rebounds. UST (23-10) will make its first trip to the NAIA national tournament since 2014. LSUS, which reached the NAIA semifinals last year, should receive an at-large berth in the NAIA tournament again this year at 22-10. PG: Jerry Murphy (5'9''-PG) of Texas Coll. Christian Bryant (5'10''-PG) of Texas Coll. Domonique Phelgm (5'10''-G) of Texas Coll.